We all know Eli loves his Roarski, while I keep a stuffed animal in the other two's crib they pretty much could care less about them, except for this off day? No one would let them go. C, I always assign puppy dogs to Thomas but it looks like they decided to overrule my descision! I should get used to this right? Even though they don't look happy they actually all got up in good moods after naptime! A very rare occurrence so I took a picture to remember. The 10 minutes after naptime is my least favorite part of the day. Can you believe it they still haven't climbed out yet, although I did see Thomas do a little ballerina leg stretch but his heel didn't even go over the top so I think we're safe for a little while longer. This is a good thing since the boys pretty much have a party before naptime and bedtime. I sometimes hear them chit chatting away an hour past when I put them down! The boys have been loving the raspberry explosion in the back yard! Sometimes you see it happening before your own eyes, and you are torn whether to intervene or to just let it happen because you might make it worse...this was one of those moments. I mentioned before that it's starting to become easier to manage the boys in open spaces so the other day we went for a walk in our neighborhood and went past a tiny little park at the end of a cul-de-sac (sp?) with a low to the ground jungle gym so I thought, what the heck lets try it and see. I felt a little bit like a herding dog, had to remind the boys to stay close A LOT but we stayed for a long time and the boys played their hearts out! I still won't take them to the big park by myself because the jungle gym is so tall (I don't want broken heads) and they don't get the concept of keeping a safe distance from the swings and I worry they'll get kicked in the head. The boys ask me to wipe their hands off now when they get sticky and dirty. And by ask I mean groan and stick their hands in my face till I clean them. I shamefully didn't get any pictures of the boys this weekend. We went to Friday and Sunday of our district convention and it was just too hard to put much importance into taking pictures. We'll be making up the Saturday we lost next weekend. The boys could have probably handled three days in a row but Phil and I can't! On Friday we had Caleb and Eli with us and they both decided to only nap for 20 min. Thomas always goes and sits with his friends A & S whom he behaves wonderfully for (but never for us). On Sunday a friend took Eli to sit with her and Caleb decided to sleep through most of lunch, thanks pal! Phil and I had our second real date since the boys have been born. Our awesome friend V and her sister and brother baby-sat so we could go to Phil's co-worker/friends' wedding. Since I don't have pics of the boys I'll share these with you. I've never been to such a rad wedding! It was sooo Portland hipster, you'll see what I mean by the pictures. For a few hours I felt cool and forgot I was a dorky mom of triplets! Catered by food carts, yum! 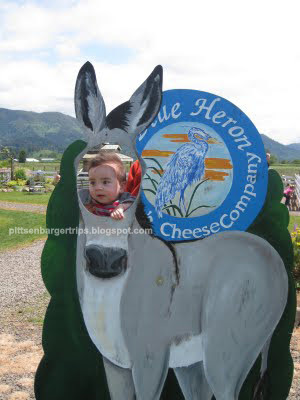 In Tillamook at the Blue Heron to pet the animals and sample their dips! Caleb thought it was great to stick his hands in the goats mouth. I told him to stop, and then seconds later something must have happened (I am sure no one got bit) but someone freaked out which set off all three boys into panic screaming! When we got home we checked to see when the last time we came was and I kid you not, it was almost exactly (+/-1week) a year ago. We totally didn't plan it either! We tried to recreate last years pic but the boys were having none of it! Now on to the beach, same spot as last year too : ) It was overcast and a bit chilly, I expected the water to feel like ice cube but it was surprisingly bearable. E, check out the sand chunks in the air, such a good picture! Me yelling at one of the boys to NOT run full speed straight into the ocean! At the Blue Heron we noticed something different, when we put the boys down they didn't run in three different directions like they normally do. They stayed close and didn't run around like crazed monkeys just out of prison! I think this is the beginning of a different way of life for us. 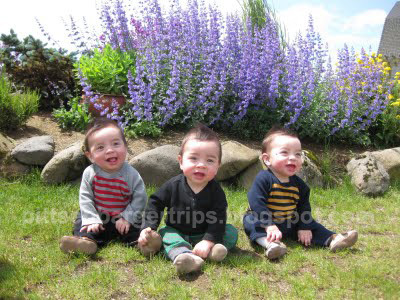 The smallest things can really make a huge difference to a family with triplets! So we had our first 80 degree day or as the lovely people of the northwest call it a 'desert blast,' ha! Thomas devoured his peach in like 30 seconds! Caleb liked his peach too! Eli's was a bit too sour and only ate half! The boys are getting their canines in and I'm giving up keeping track of teeth. I dare not stick my fingers in their mouths anymore, ouch! We went to the coast on Sunday but I'll save those pics for the next post! Caleb runs faster than his good judgement! I had Phil round the boys up to come back inside the house. As I come out the door to help bring them inside I see Caleb running at lighting speeds when he sees an approaching step and he tries to stop himself but he's going too fast and his head is so big that it propels him forward to where he just dove head first onto a patch of gravel. He must have hit a sharp rock because he had a cut that bled pretty good (5-6 drops). Oh and I should mention he scraped up the same spot where he'd already had a scrape from a similar incident where tried to stop and pick up a piece of chalk, but again he had no time to slow down! At the same time Caleb falls out of the bath tub as Eli goes underwater (not intentionally)! Panic! Oh Crap! #27 this one made me really really mad! It always starts with a loud crash! The boys knocked over the dvd player, the vcr (yes we still have one), and you can't see it in the picture but also our beloved wii! Not to mention they ripped the tape of their 12-15mo homevideo! Now I have the wonderful side project of fixing the miniDV, argh! This is how I found them. It begs the question what is that stupid fence really doing for us now other than making my house look ugly and facilitating their climbing? I was putting shoes on the boys when I notice that Eli had already put on both of his slip on shoes by himself and on the correct feet! It wasn't perfect since he was stepping on the heel of one shoe, but that's still pretty good! The boys have gotten used to being unrestricted in the bath tub and they get pretty wild in there so I can kiss story time during bath time good bye. I've also been having a hard time getting Eli out! That boy LOVES the water. The next 80 degree day I'm busting out the kiddie pool and someone better tell Eli that there isn't going to be a lot of room left once I get in! Here is a cute video of Thomas saying 'baby,' too bad I couldn't get a video of him saying 'baby' and pointing at himself like he did the other day, so cute! How DO you do it! ?